Kidorable, a leading designer and wholesaler of children's products, transforms everyday, functional kids' apparel and accessories into objects that excite children's imaginations and enrich their lives at play. Kidorable is distinguished by their high quality, unique collections - from frogs to fairies, dinosaurs to dolphins, and ladybugs to lotus flowers - sold at apparel, shoe and gift retailers across the globe (excerpt taken from kidorable.com). As soon as I found Kidorable I fell in love with their designs! I love fun, matching pieces and they have that & more. 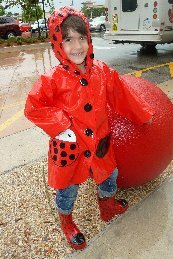 The Lil Divas and I were so excited to have a review opportunity with Kidorable because we have been itching to get our hands on their adorable rain wear for some time. 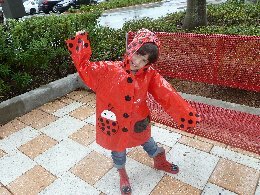 For this review the Oldest Diva received the absolutely adorable Ladybug Rain Coat and Ladybug Rain Boots. As soon as we opened the package - she was giddy with excitement and had to try everything on! We loved how lightweight and easy the rain jacket and boots were to put on. Unfortunately, we had no rain here in FL for awhile so we did not get to test it in the elements until recently. Just a few days ago we finally had some rain! 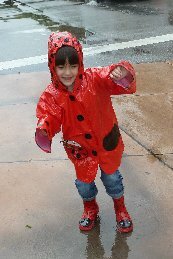 The Lil Diva was happy to finally be able to put on her ladybug rain gear and head outside. She happily splashed, ran & played in puddles and I am happy to announce that her socks and feet remained dry after inspection upon our return home. I was a bit worried because she was doing lots of splashing and high jumping but she remained dry. Another feature I really liked on this particular rain coat was that the hood is gathered right at the top which kept it on her head. This has been a problem with other rain coats in the past - the hoods easily fall off and the Lil Divas get wet. I was happy to find that this hood was crafted to remain in place and it definitely did until she pulled it down herself. 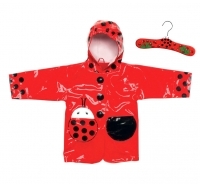 Overall, we highly recommend Kidorable's rain gear. We can only speak specifically for the products we tried but we were so pleased that we are planning to order the Ballerina Set for the Littlest Diva, who was highly disappointed not to have her own Kidorable rain gear, and both girls the matching umbrellas. I am so excited that Kidorable has graciously agreed to give 1 lucky Mom to 2 Posh Lil Divas follower an adorable Kidorable Umbrella! Visit Kidorable.com and tell me which product line is your favorite! Make a comment on any non-giveaway post on Mom to 2 Posh Lil Divas Blog and leave a link. You can do this for up to 3 posts but please note that comment must be dated after the start date of this post - not valid on previous comments. 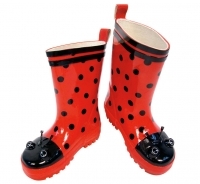 Disclaimer:I received a rain coat and rain boots for the pruposes of trying them out for this review. That being said, this review is my 100% honest opinion of this product - I am not paid for my reviews or optinions! They are 100% mine! Please remember that your opinions and tastes might differ from mine. I love the space theme so cute! I like the lotus flower line. I commented on your "Public, Charter, or Home School?" post. I love the Lady Bug Line all so adorable!! I love love love the Pirate one! My son does too!